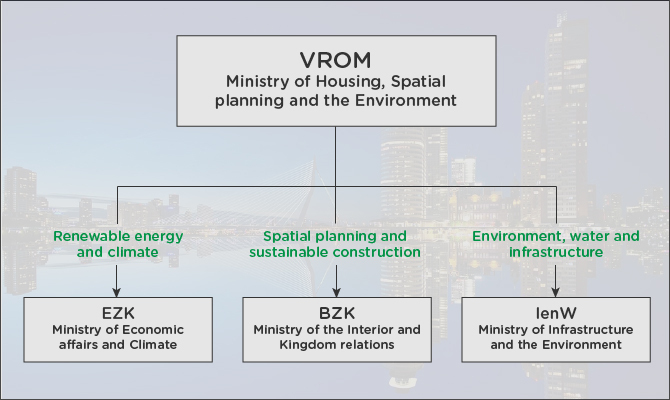 The Ministry of Housing, Spatial Planning and the Environment (VROM) has ceased to exist as of October 2010. The ministry was responsible for policies on public housing, spatial planning, immigration, energy and the environment. The Netherlands is one of the most densely populated countries worldwide. Hence, allocation in Living space, nature and other welfare society needs should be well balanced. The environment in which we live, work and recreate is not only meant for the current generation but for many future generations to come. The new ministries work hard and in close co-operation to find sustainable solutions for improving the (living) environment and make a policy in pace and harmony with current technological and social developments. Of course, co-operation with other governments, social organizations, businesses, interest groups and civilians is key in this ongoing process. Freedom in responsibility; Citizens are free to make decisions in a socially responsible way. Sustainable development; Managing the living environment, energy, raw material and nature in a way that will allow future generations to benefit from them optimally. Diversity; The quality of the living environment. Social justice; Satisfying expectations and wishes of the general public as well as being considerate towards the weak in our society. The Ministry of VROM was originally founded as the ministry of Reconstruction and Public housing with its main goal to (re)built houses after the Second World War. After the reconstructions, the ministry was renamed to the ministry of Public Housing and Spatial planning (VRO). Later on, land management and the environment became more important, so the ministry was again renamed to the Ministry of Housing, Spatial Planning and the Environment (VROM). The ministry also had responsibilities regarding environmental issues and policies outside the Netherlands.